Diane Lockie has provided these photos taken by her father around 1966. This view is eastwards and shows the stretch after Kings Arms Alley, numbers 273 onwards. The old Coronet cinema turrets are visible (numbers 274 & 275). See a postcard image from around 1913 showing the same area. 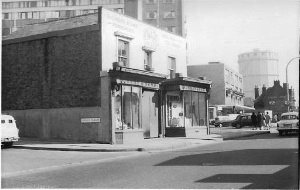 This view looks westwards and shows the stretch from Moore Bros (291) and the bow windows of Rattenburys at 288 & 289 High Street. 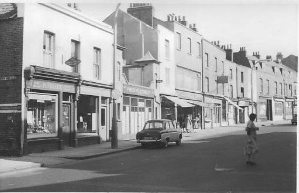 This view was taken further along the High Street to the east and shows Howard and Sons, ironmongers at numbers 298-300, still standing although properties on either side had gone. 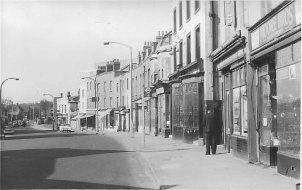 The site includes a postcard image dating from the early 1900swhen Howards business had already been operating for nearly 50 years and another photo of this area taken later in the 1960s, by which time Howards had gone. More about numbers 273-289, numbers 290-296 and numbers 297-318.area.